Miracle has emerged the winner of the Nigeria’s biggest reality TV show, Big Brother Naija, BBNaija which started since January 28, with 20 housemates. Recall that five top finalists, including Miracle, Tobi, Cee C, Nina and Alex are in the race for the all-important grand prize on Sunday. 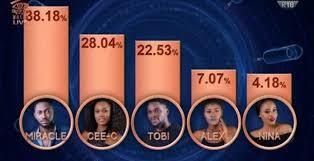 However, Alex, Tobi and Nina where evicted leaving Miracle and Cee C.